Palliative medicine - area health care, designed to improve the quality of life of patients with various nosological forms of chronic diseases mainly in the terminal stage of development in a situation where the possibilities of specialized treatment are limited or exhausted. Hospice care - a kind of palliative care for patients in the terminal stage of any chronic disease (cancer, AIDS, multiple sclerosis, chronic nonspecific bronchopulmonary diseases and cardiovascular system, and others), When treatment already does not give results, the prognosis is poor in respect to recovery and life . Hospice - is a medical facility where a team of professionals provides comprehensive care to the patient who needs to alleviate the suffering - physical, psychosocial and spiritual associated with the disease, which is impossible be cured, and it must inevitably lead to death in the foreseeable future (3-6 months) . - Granting of a short rest for relatives, caring for seriously ill.
- Eliminate or reduce pain and fear of death in patients with the maximum possible preservation of their consciousness and intellectual abilities. - Providing medical supervision, conducting symptomatic treatment, which uses special multistage protocols of nonnarcotic and narcotic analgesia; treatment of adverse and associated diseases patients. - Psychosocial adaptation of patients. 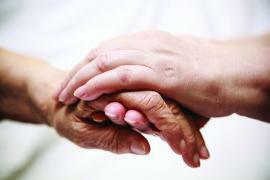 - Training of family members how to care for hopelessly sick. - Provide psychological assistance to family members having or lost a hopelessly ill relative. - Development of relationships to death as to a natural stage of a man's ways. - Study, synthesis and application in practice of advanced experience of hospices, the propaganda of the volunteer movement. - Improving professional qualification, the theoretical level, and conducting systematic training and educational work with the medical staff.